When The Awakening popped up as one of my next five in the 1,001 Books list, I wrote that I wasn’t totally enthused by the idea of reading it. Frankly, if I’d realised the reputation it has as an early feminist classic, I’d have been really unenthused, not by having to read but more by having then to reveal my thoughts on it to the world and possibly incurring the wrath (or, worse, disdain) of you all. 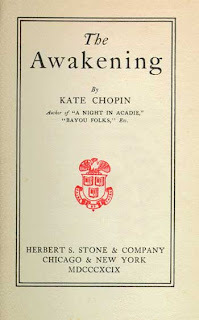 Anyway, I’m pleased – and slightly surprised – to be able to report back that I actually enjoyed The Awakening and really appreciated a number of the themes Kate Chopin deals with in it. I less pleased – or rather, more trepidatious – about having to acknowledge that I have a couple of fairly major reservations about the book itself and the way it appears to be treated. I loved some of the symbolism of Chopin’s writing and, in particular, the use of the swimming scenes to represent freedom. It’s odd, I suppose, because water actually provides more resistance to movement than air, but I too feel completely free when I swim, especially in the sea and so I completely identified with Edna, both when she discovers she can swim and overexerts herself as a consequence and at the end when she takes her final swim. I also enjoyed the depiction of turn of the century life in Louisiana. 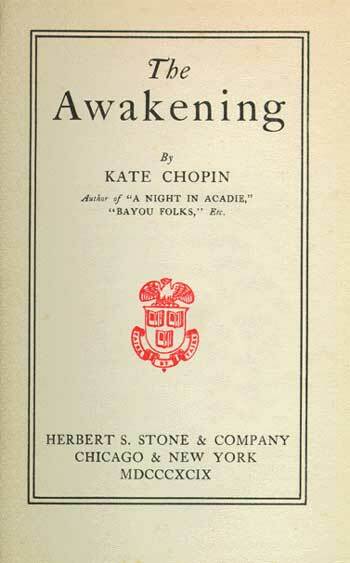 Chopin conveys a wonderful sense of both place and time without needing to go into huge descriptive detail. The titular awakening is all about Edna’s awakening to a sense of self, of individuality, of identity in an age of social conformity. It’s easy to see this as a feminist concept as we see Edna trapped in a loveless marriage to a husband who, although materially generous, treats her as part of his property and, at the beginning, exercises a kind of casual control over her and her actions. If one takes this line, it then becomes easy to view Alcée as a shallow, vacuous gadfly and to take a dim view of Robert’s ultimate rejection of Edna – in effect, he’s just as bad as Leonce in accepting a patriarchal world view. Actually, and at the risk of annoying a lot of people, I think Edna’s awakening is far more universal. I can see how it’s viewed as a feminist text but I think it’s more a text about the struggle for individuality in a conformist society. It is not only Edna and the other female characters in The Awakening who are trapped in the social handcuffs of the time. Robert too is caught, as are the other male characters. Robert takes himself off to Mexico and then rejects Edna, not because he doesn’t reciprocate her feelings but because he can’t break free from the moral and social imperatives of the society to which he belongs. "And, moreover, to succeed, the artist must posses the courageous soul." "What do you mean by the courageous soul?" "Courageous, ma foi! The brave soul. The soul that dares and defies." I would humbly submit that this is the crux of the book: the true individual (here, the artist) must dare and defy society to establish his or her individuality in the midst of a conformist group. "I would give up the unessential [for my children]; I would give my money, I would give my life for my children; but I wouldn't give myself. I can't make it more clear, it's only something which I am beginning to comprehend, which is revealing itself to me." Her suicide is the recognition that she cannot keep her self and her true identity in the society in which she lives and so, rather than surrendering herself to an unhappy existence for he sake of her children, she relinquishes her “inessential” life. I’m not a philosopher and so am not in a position to debate whether identity is independent of body – there are much better qualified people to do that, but as a matter of day-to-day reality, it just strikes me that killing oneself to preserve one’s sense of individuality is a bit like cutting off your nose to spite your face. Unless Edna’s immortal soul is sitting on a cloud somewhere painting a picture and being attended to by an incorporeal Robert, her “identity” for all practical purposes ceased to exist the moment her lungs filled with water. I also can’t help feeling that acting in such a morally defeatist way – I can’t do what I want so I’ll give up – isn’t really a great feminist statement. In my knuckle-dragging, male-oppressor kind of way, I’d have thought that the true statement of female strength and identity would have been for Edna to take the kids, stay in her own house, open up an art gallery (or even a bookie’s – she seems to be good with the horses) and stick two fingers up to Leonce and the rest of New Orleans. Hell, she could even have slept with Alcée and really scandalised society. However, having said that I don’t like the ending from a political or moral point of view, it is a pretty good ending from a literary perspective. It was well written (especially the final paragraphs) and made total sense from a story-telling angle. It’s difficult to think of alternative endings that wouldn’t have detracted from everything that came before. So, to conclude, I enjoyed reading this. It was thought-provoking and not in any way the “girl power” type horror I had feared it would be. Despite my misgivings about the premise of the ending and my instinctive dislike of her leaving her children motherless, I think The Awakening is an important text, although labeling it “feminist” does it an injustice – it has far more universality than that. I greatly enjoyed reading this post. Your thoughtful discussion is quite insightful. I completely agree that Edna's awakening is universal and not strictly a feminist message. In particular, I tend to view this as an existential text, which in my definition fits perfectly with your summary: "the true individual must dare and defy society to establish his or her individuality in the midst of a conformist group." I think this is the basis of all existential literature, and it adds a significant dimension to the reading of the text. The only thing I would challenge is your interpretation of her suicide. I don't think that it was simply a case of "killing oneself to preserve one’s sense of individuality." Rather, I would argue that she felt great despair in the inability to reconcile her disparate identity. I don't think she was trying to accomplish or preserve something in her suicide. Instead, I think she was giving up. Now, this is indeed depressing and certainly not a promising solution for feminists. But I think it is very true to existentialism, and as you said, it makes for a beautiful literary ending. Thanks for leaving such a great comment. I'd set out the "preserving individuality" interpretation of Edna's suicide as what I believe is the most commonly held interpreatation. I personally actually agree with your view on it and, although happy with the suicide from a literary perspective, I too think that it's not a great act from a feminist perspective. I have popped over to your blog and read your review. It's funny but I hadn't actually tied it in with other existentialist stuff I've read (Camus and a bit of Sartre) but you are dead right! Thanks for responding, Falaise. I really do enjoy your blog! Are you trying to make cash from your websites or blogs using popup advertisments? If so, did you try using Clickadu? Did you know that you can create short links with AdFly and get $$$$ for every visit to your short urls.